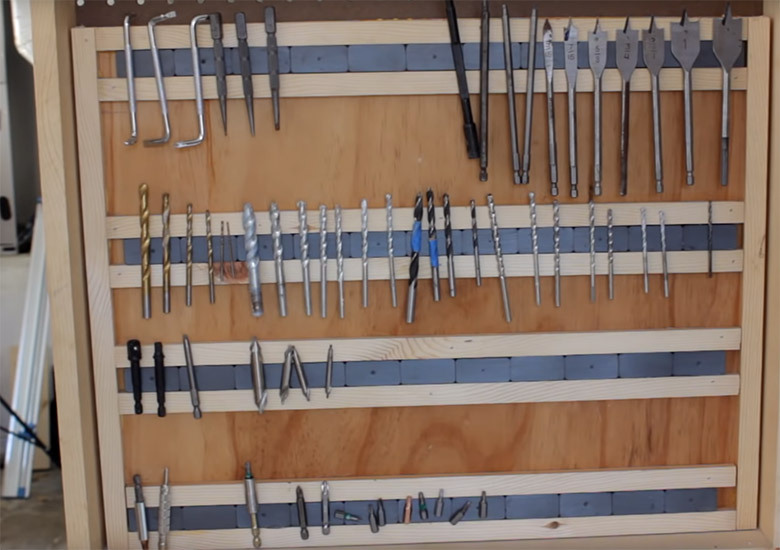 12 Tool Storage Ideas – Keep Your Workshop Tidy! An organized workshop is a happy workshop, and if you’ve ever had to search through shelves, drawers, and containers to find what you need, you know how important organization is. To some, organization can seem complicated and hard to get started with. 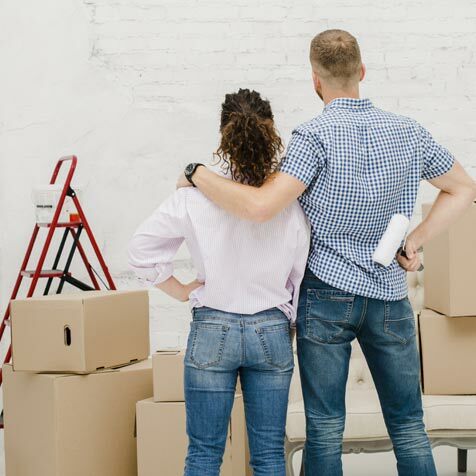 However, regardless of your level of expertise, budget, or available space, or specific needs, there is a way you can make your workshop work better for you. Below we’ve included 12 different tool storage ideas for you to consider so that you’re always able to find what you need. Whether you’re looking for something cheap & quick or large & custom, there’s an idea for you. One of the most important parts of smart tool storage is the ability to see and pick out the right tool for the job. If they’re buried in a container or in piles, you may miss what you need. If you don’t need a full on garage storage system, then a simple pegboard may be the simpler option. 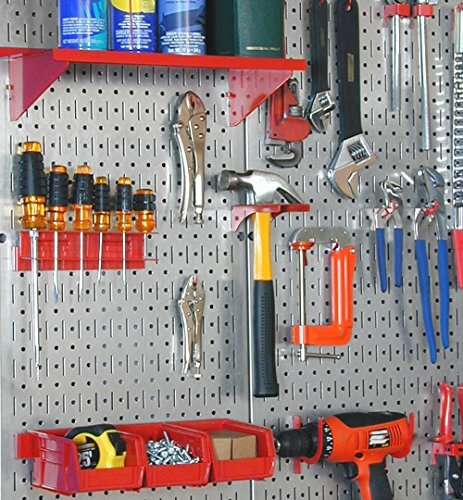 With a pegboard, you can position the pegs to spread your tools out across an entire length of wall so that everything is immediately in view, sorted, and easy to grab. It’ll also allow you to store as few or as many tools as you want, always with more room to grow with different configurations of pegs. Cordless drills and drivers are so much easier than your standard non-powered tools, but they also take up more room & need to be charged. Fortunately, with a charging station you can take care of both problems at once. 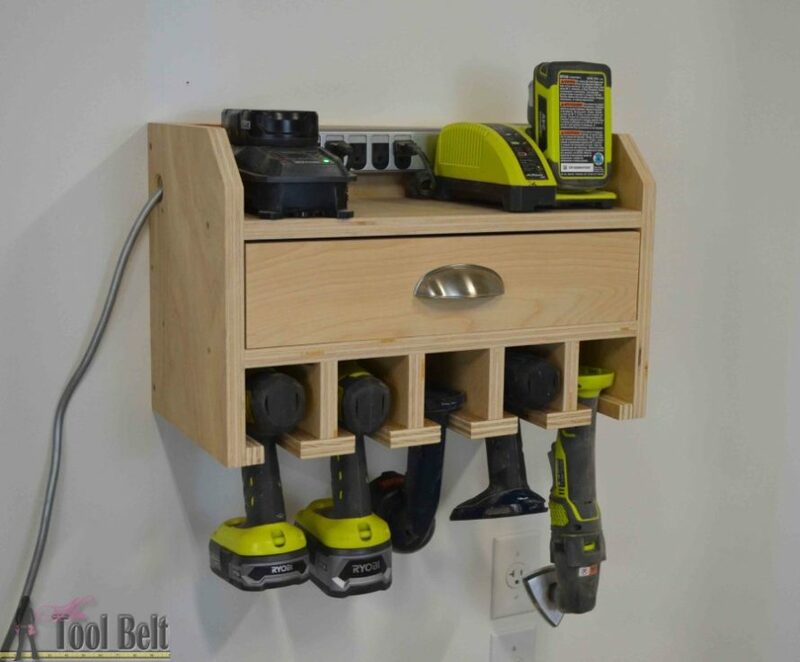 You’ll need to choose a location near an outlet to make it work, but if you have the space your wooden station can hold multiple cordless tools, charge batteries, and even hold drill bits with the help of some magnetic tape. You can read the full tutorial over at Her Tool Belt. PVC pipes have a ton of uses for storage – especially when so many hand tools seem to fit perfectly inside! To store tools individually without the need for a full pegboard setup or taking up workbench space, consider hanging PVC pipes on the walls. Simply cut them at an angle so they sit flush with the wall, mount them with screws, nails, or adhesive, and you have the perfect screwdriver, plier, blade, or tape measure holder. Learn more about how to do this over at Instructables. 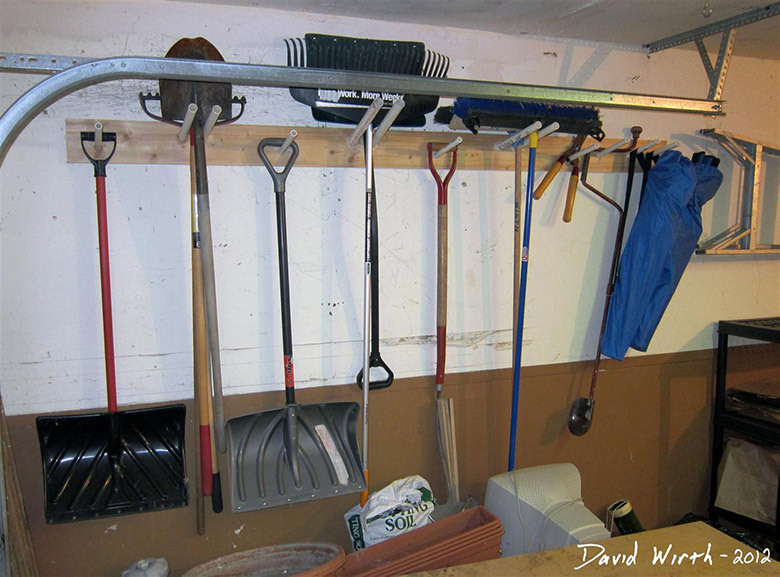 Similar to the idea above, you can also use PVC pipe to neatly store your long handled harden tools. The undersides of a pallet aren’t just there to make it easy on forklifts to transport them – they also happen to provide excellent organizational potential for larger yard tools. he front side will stop them from falling forward, and they’ll be super easy to pull out & put back when necessary. You can even paint or design the pallet to fit the rest of your garage. Do you have a tape drawer? If you’re like many workshops, you’re digging to find the tape you need & praying it has an end you can find. However, if you had a tape dispenser that not only held the end of the tape for you but also provided teeth for severing the tape, you’d have a much easier time. This method also makes it easy to use tape one handed and shows you the tape, so you don’t have to sort through your tape collection to find what you need. 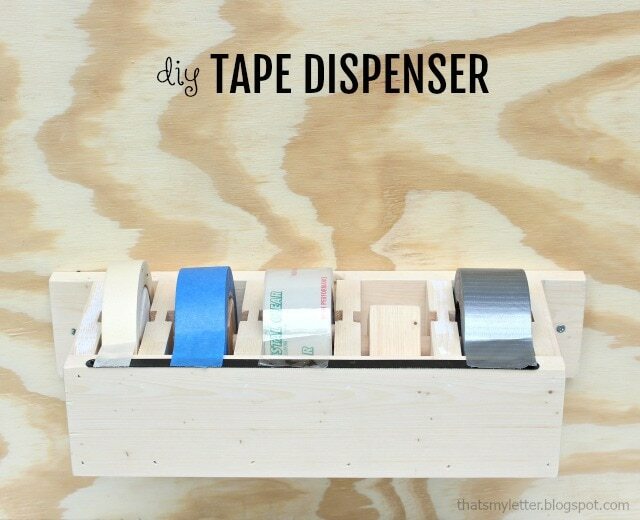 Stick a label on each dispenser and even non-handy family members can get tape when they need it. Looking for a more custom tool storage approach that fits your tools rather than requiring your tools to fit it? Foam filler – the same often used to insulate homes – is great for form-fitting your storage containers to your tools. Whether you choose a tool chest, drawer, or other storage device, you can fill the space and press the tools to form the foam to their shape. This way everything has its place, stays in place through transport, and is protected from wear & tear. 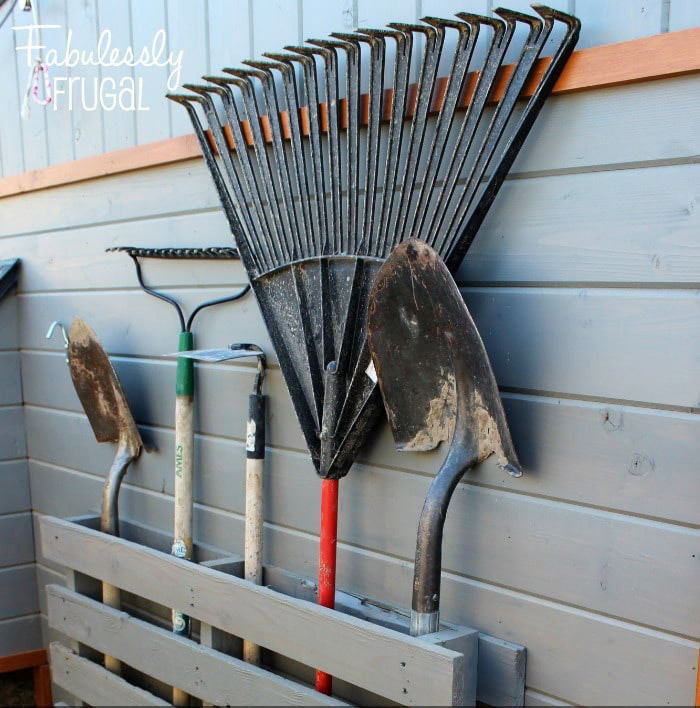 If you’d prefer to hang your tools than sit them in a pallet (or you just don’t have one on hand), you can consider a wooden plank & PVC pipe wall rack for your larger lawn tools. 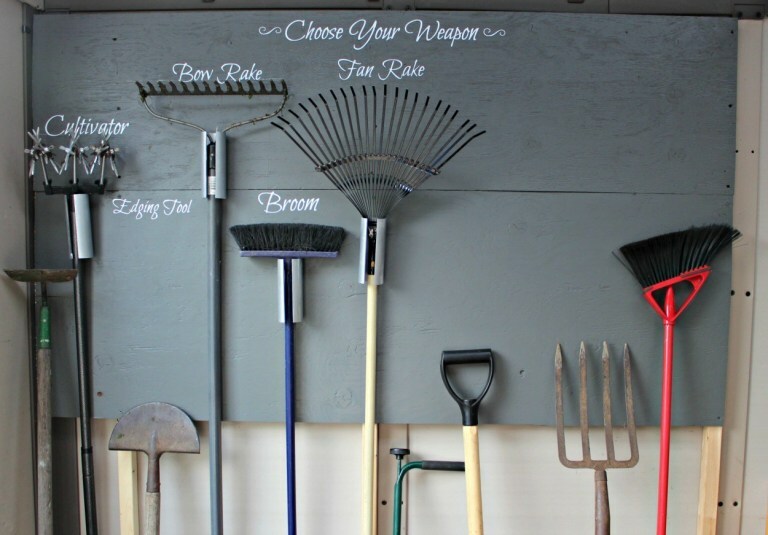 With a wooden base attached to the wall, you can secure PVC pipes to hang handles on, hold the heads of shovels or brooms, and more. This low-cost solution is simple, fits on just about any open wall, and can be customized to hold what you need (and added onto at a later date). 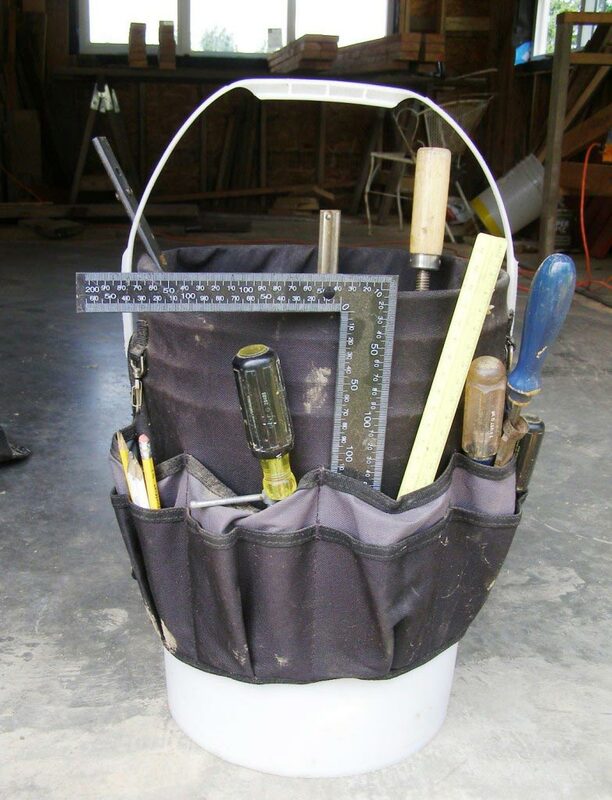 5-gallon buckets are a favorite storage container for workers on a jobsite because they allow you to carry a collection of tools, loose materials, and more at once. 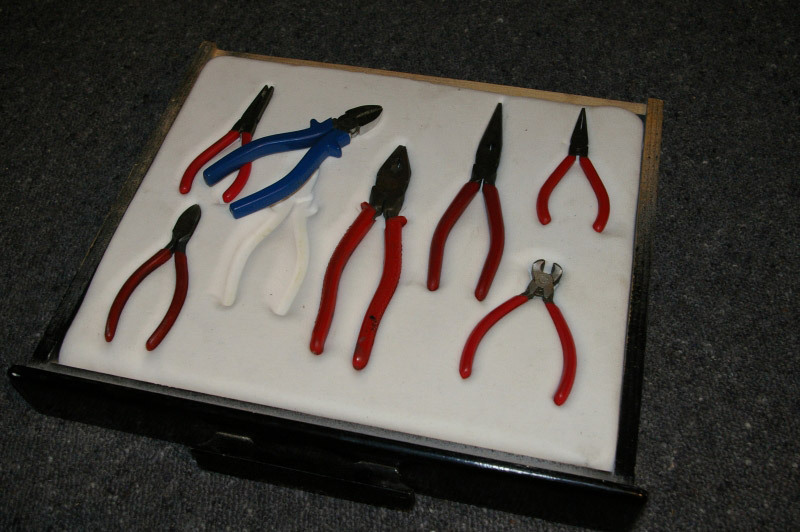 The same benefits apply to your workshop, allowing for easy access to your most used tools. 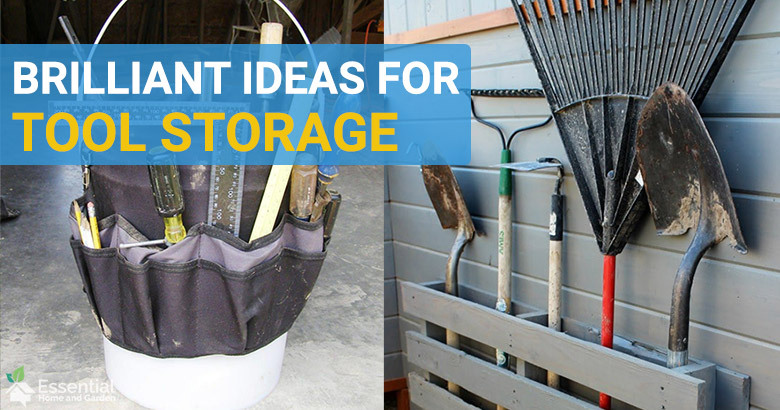 Add on a tool belt or apron to the bucket (or buy a premium bucket outfitted with extras) and you have even more mobile functionality or space-effective storage. Many tools & accessories are made of metal, making magnets an effective way to hold things securely. When it comes to drill bits & smaller metal accessories, it can be hard to find an effective way to store them while still making them visible & easy to access. With a simple piece of magnetic tape on a bench, shelf, tool belt, or just about anywhere, you can safely suspend these loose pieces so that they don’t get kicked under the bench or lost forever. 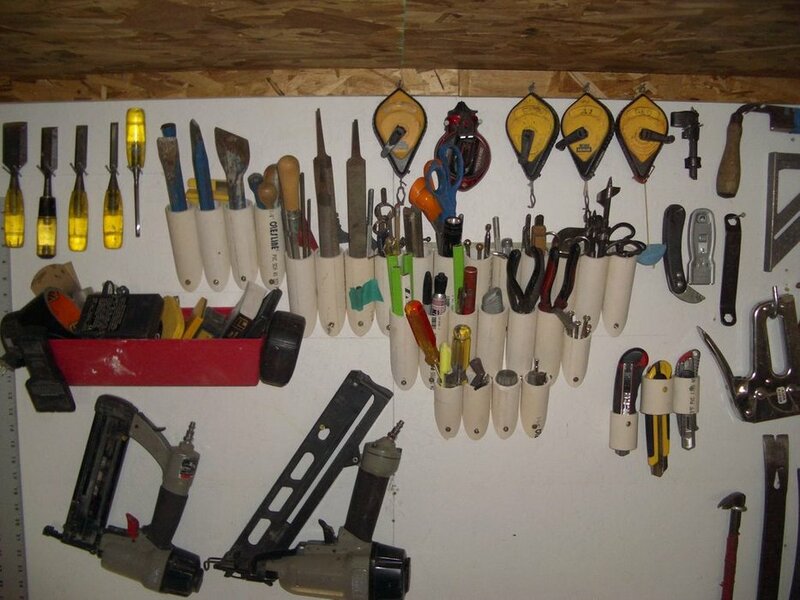 There’s no need for your garage or workshop to be disorganized. An organized workshop makes it easier to find things, saves space on your workbench, and protects tools from wear. 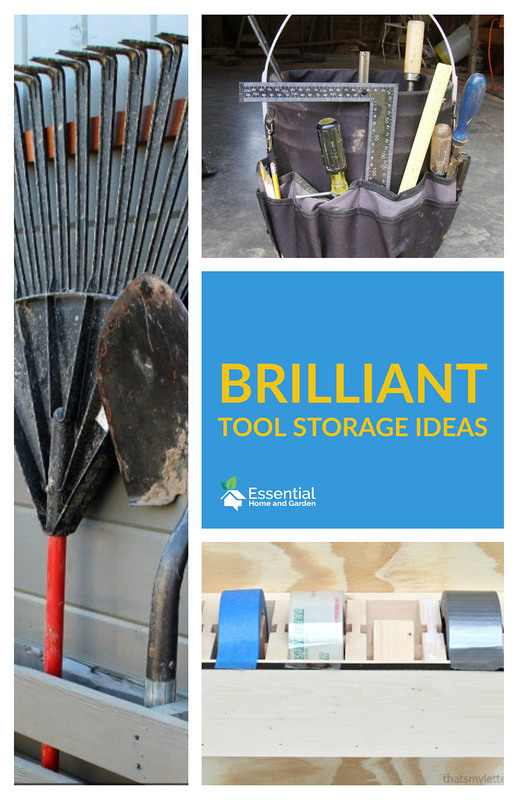 No matter your budget, there’s a simple and effective tool storage idea for you. Try one – or a few – of our recommendations to take your workshop to the next level. Watch the full tutorial here. Whether a handsaw or part of a Sawzall, blades need to be sharp and clean in order to work best. In addition to posing a safety hazard when exposed, the teeth of a saw blade can rust when left out, dulling the blade and weakening the metal. Fortunately, rubber is great for holding the sharp teeth firmly, protecting them from rust & damage as well as protecting them from cutting anyone. All you’ll need is a rubber hose that can be cut to size and you have a sleeve. Dremel Vs. Rotozip – Which One Should You Buy?